A stye (or hordeolum) is an inflamed oil gland on the margin of the eyelid at the level of the eyelashes. It appears as a red, swollen bump that resembles a pimple in appearance. It is sometimes tender in its acute presentation, especially to the touch. More chronic appearance of a stye often leads to a chalazion; a painless inflammatory response of the meibomian oil glands of the eyelid. 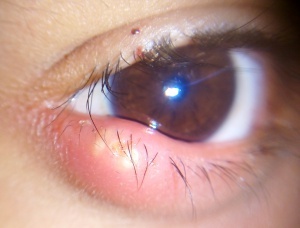 Hordeola may be on the external or internal surface of the eyelid and may lead to edema of the entire lid. At times, purulent material is released from the outer eyelash line in external hordeola, while internal hordeola exude on the inner conjunctival surface of eyelid. A stye is caused by normal bacteria from the skin that invade the oil glands in the eyelids that normally contribute to the tear layer of the eye. Styes are similar to common acne pimples that occur elsewhere on the skin and patients may have more than one stye at the same time. They commonly develop over a few days and may drain and heal without treatment. Staphylococcal bacteria are the most common causes of eyelid infections, but other organisms normally found on the skin may be precipitating factors. Hordeola are found more frequently in patients with dry eyes and chronic blepharitis (eyelid inflammation). Staphylococcus aureus is the bacteria responsible for the overwhelming majority of cases of hordeolum. An external hordeolum arises from a blockage with secondary inflammation of the Zeiss or Moll sebaceous glands of the eyelid. An internal hordeolum is a secondary inflammatory response of the meibomian glands in the tarsal plate. If left untreated, the condition may spontaneously resolve or it may progress to chronic granulation with formation of a painless eyelid bump known as a chalazion. Chalazia may grow to become large and can cause visual interference by deforming the cornea, leading to induced astigmatism or reduction in the superior peripheral visual field. Although rare, cellulitis of the eyelid may occur if an internal hordeolum is untreated. Most morbidity is secondary to improper drainage of the inflamed tissue. Daily eyelid hygiene with a mild soap and warm water is necessary to reduce the incidence of styes. Eyelid and face make-up should be removed completely before going to sleep. It is important to wash hands thoroughly before touching the skin around the eye. Patients who are susceptible to styes should carefully clean excess oils from the eyelid margin. Commercial eyelid scrubs are available and may be recommended by an eye doctor as primary prevention for styes. Patients usually report a localized painful swelling of one or more eyelids. In some cases, the complaint may start as a generalized edema and erythema of the lid that later becomes localized. A history of previous similar presentations is common. Generalized changes in vital signs and systemic symptoms are extremely rare in the presentation of a hordeolum. In extreme cases, the condition may spread to involve the entire eyelid and even the adjacent facial tissues. These cases do not respond to conservative hordeolum management and must be treated as periorbital cellulitis, requiring oral and/or IV antibiotics. A complete examination of the area around the orbit, the eye, and the conjunctival surface is necessary by an ophthalmologist. Careful inspection the underside of the eyelid is necessary to distinguish an external from internal hordeolum. 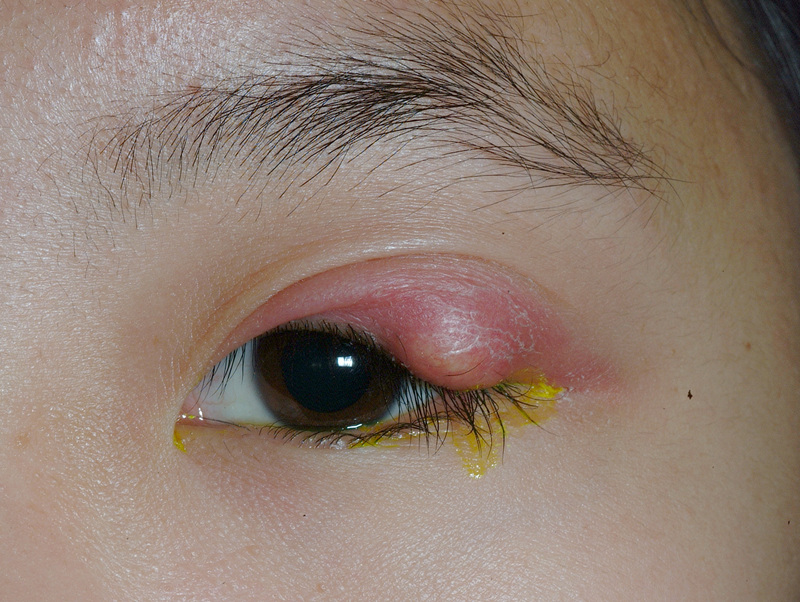 Examination reveals a localized, tender, erythematous, elevated area with a pointing eruption either on the inner or outer side of the eyelid. Palpation of adjacent lymph nodes can help to identify spread of the disease beyond an uncomplicated eyelid lesion. Lymph nodes should not be involved in patients with a simple hordeolum. Visual acuity, slit lamp, and dilated funduscopic exam is necessary to rule-out extension of eyelid pathology. Consultation with an ophthalmologist or ophthalmic plastic surgeon is necessary for appropriate diagnosis and management. Styes and chalazia may be treated by applying warm compresses to the eyelid several times per day. This helps to accelerate drainage of the lesion. Antibiotic ointments with concomittant steroid may help styes to resolve more quickly. Regular follow-up with an ophthalmologist is necessary to chronicle regression and monitor side effects from medications. In some cases, injection of triamcinolone (Kenalog) can help in resolving the lesion, although carries the risks of skin necrosis, subcutaneous fat atrophy, embolic visual loss, incomplete resolution and need for surgical removal, and skin hypo-pigmentation or hyper-pigmentation (particularly in patients with darker skin tones). Patients are prepped with antiseptic solution and draped in the usual sterile fashion for ophthalmic surgery of the eyelids. Local anesthetic is injected into the eyelid lesion. A chalazion clamp is used to hold the lesion in place prior to incision and a scooping instrument is used to remove any inflammatory debris. Drainage may be performed with a stab incision overlying the lesion using a #11 blade. External incisions may lead to scarring, so making external eyelid incisions or punctures is less desirable. In this case, the incision should be made through a lid crease if possible. Internal incisions may be made vertically to reduce the area of the cornea swept by the irregular healing tissue during blinking and prevent lid contracture that may contribute to malposition; external incisions may be made horizontally for optimal post-operative cosmesis. The incision is left open with clean margins to allow for drainage of any residual material within the lesion. Cosmetic deformity and visual disturbance are the most common complications of styes. If left untreated, styes may rarely lead to more widespread infections that involve the periorbital tissues. Also, stye recurrence is common if prophylactic daily lid hygiene is not done upon resolution. Complications of improper drainage include disruption of lash growth, eyelid deformity, or eyelid fistula. Porter D, Edmond JC. Inflammation, General. American Academy of Ophthalmology. EyeSmart® Eye health. https://www.aao.org/eye-health/symptoms/inflammation-general-list. Accessed March 13, 2019. American Academy of Ophthalmology. Oculoplastics/Orbit: Hordeolum (stye) Practicing Ophthalmologists Learning System, 2017 - 2019 San Francisco: American Academy of Ophthalmology, 2017. This page was last modified on March 13, 2019, at 16:32. This page has been accessed 52,270 times.